The Petwo nation of Spirits are Hot, Aggressive, and get things DONE! Mare Paket is a beautiful, colorful, fiery Petwo Ceremony that takes place during Kanzo (Initiation). Paket Kongo are ritual items made by skilled Manbo and Houngan Asogwe, which are given to new initiates to take home after Kanzo is completed. Saluting the Lwa who embodies the crossroads, is essential in opening the way, so all that juicy Petwo magic can come forth and flow. 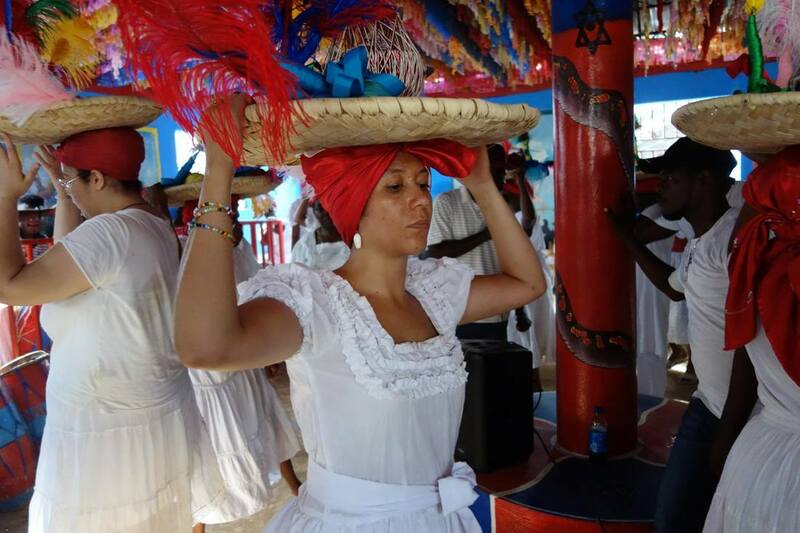 Kalfou is the Kreyol version of the French word "Carrerfour" which means crossroads, In true Petwo fashion, Met Kalfou is called upon with fire, the drums are blazing, rum is sprayed, energy is high and intense with a purpose: to heat up the Pakets, to strengthen the initiates relationship with the spirits in their spiritual esko. but you keep going anyway"
During my Mare Paket ceremony, my stomach was turning flips, knees were shaky & body extremely hot. 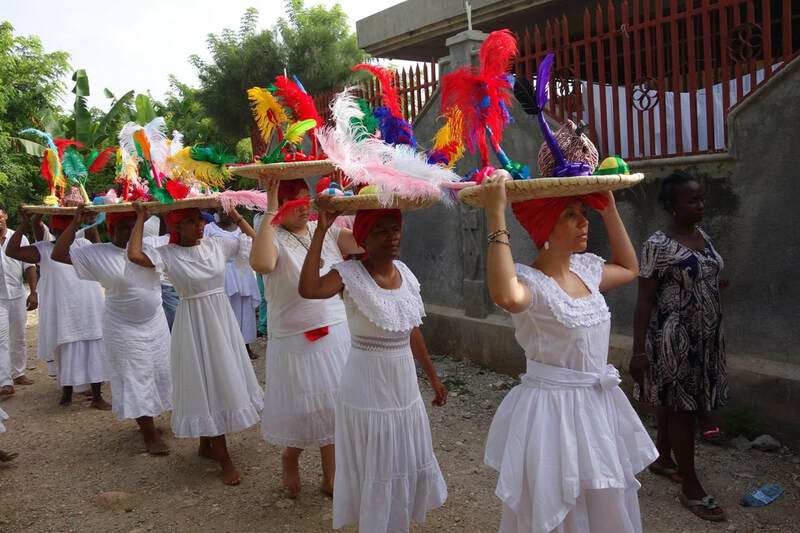 It wasn't meant to be easy, with Haiti’s blasting July heat, blazing Petwo drums, AND overtaxed arms, while carrying a large basket of powerful, ritually charged medicine on my head. Admittedly, I didn’t think I was going to make it. 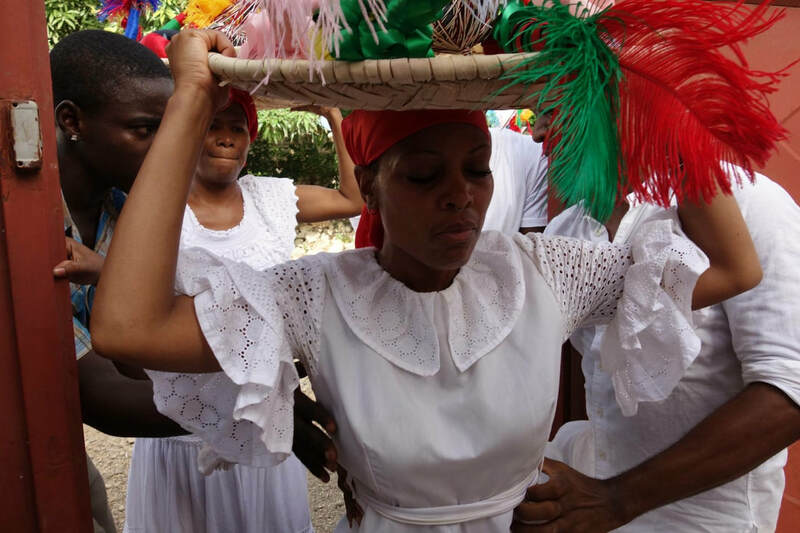 But the thing is: if you know anything about Bwa Kayiman, you know that the rituals, salutations, oaths, dances, songs and drums, were the catalyst of a major defeat - The Haitian Revolution. Born from the Petwo nation. A mighty nation. A nation of spirits that gave enslaved Africans, revolutionaries, and freedom fighters, the strength, determination and mental capacity to execute a revolt that would change the course of history. and eventually made it through. 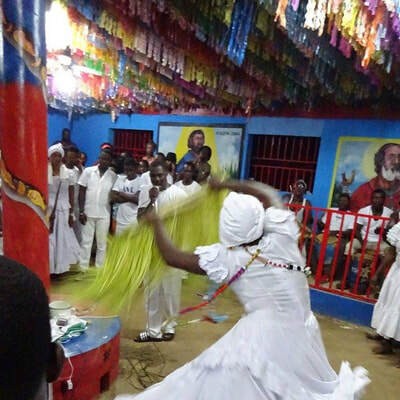 Inside the temple, initiates dance around the Poto Mitan with their Paket Kongo in a Laye, placed on their head, spinning, continuously to activate possession, which confirms the spirits presence and energy within the Pakets. 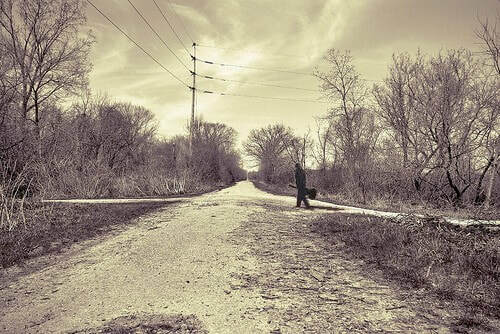 It’s stepping into the unknown. There are also reasons why initiates are tight lipped and reluctant in revealing too much information. 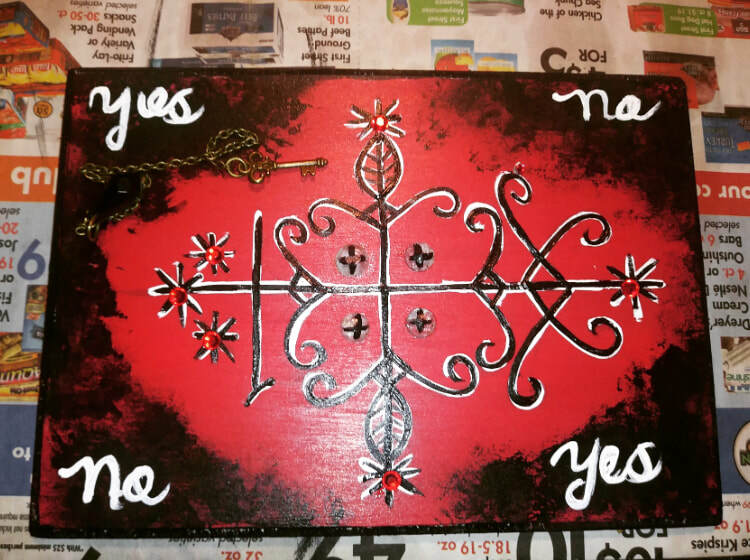 African Spiritual Traditions ARE Secret Society’s. We take OATHS, heard by God, our ancestors, spirits, and an entire community! Initiation is a sacred act of complete sacrifice and devotion to Spirit. Unfortunately, you will not have this experience reading through pages of a book. 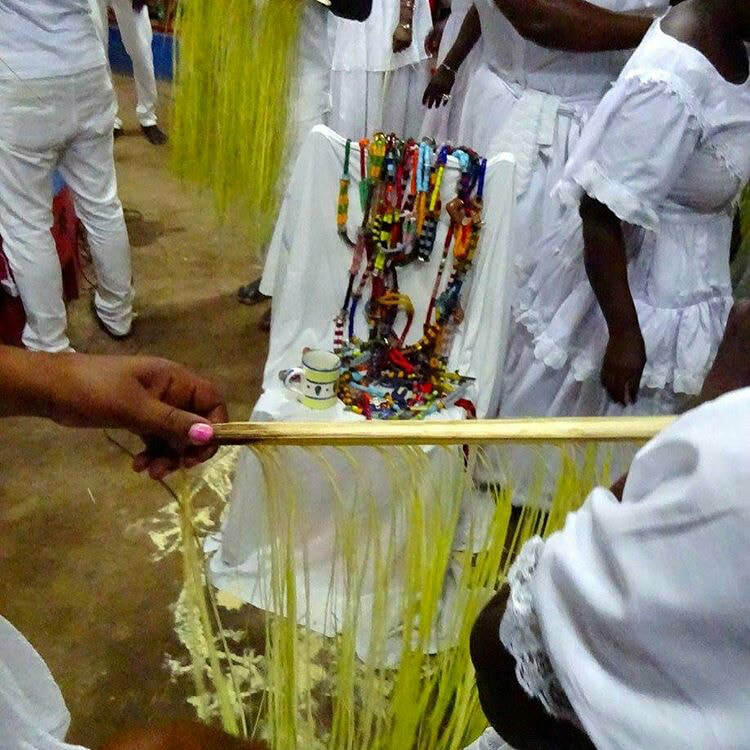 This experience was/is an actual RITUAL & PRACTICE that requires faith and courage. The Mare Paket ceremony liberated my soul. Empowered my entire being and reinforced the reason we salute these mighty Petwo spirits. Typically, in African Traditional Religions initiates are adorned with beads that have been consecrated and ritually fed. In the Orisha/Lukumi Tradition, Elekes are beaded necklaces in patterns and colors of the Orisha. 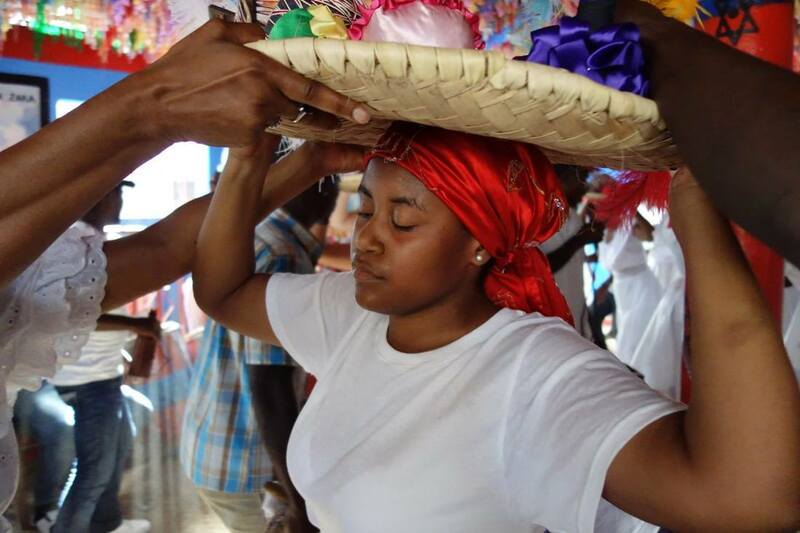 Once an individual’s head is crowned to an Orisha, other adornments such as bracelets for Oshun, Yemaya and Oya, in addition to an Ide - an intricate beaded bracelet indicating the initiates head Orisha, is also worn. 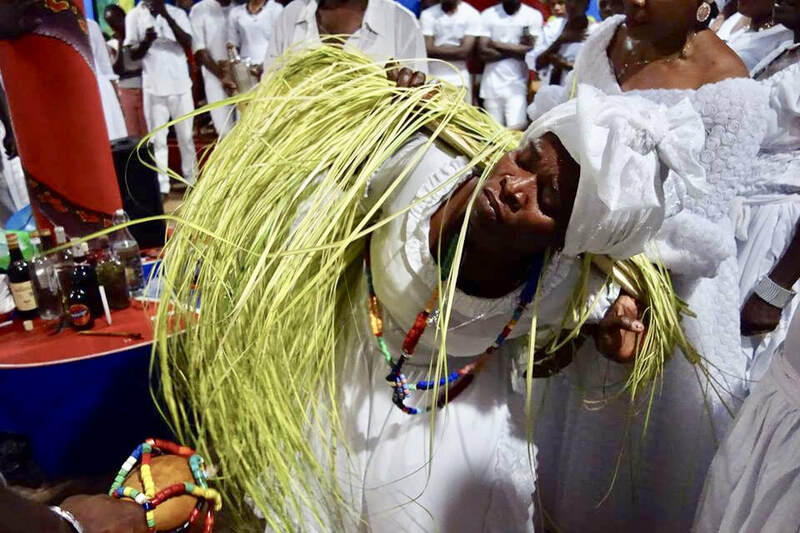 In Haitian Vodou, none of the aforementioned accessories exists within our spiritual/initiation system - with the exception of a sacred beaded necklace, known as Kolye. Kolye’s are long in length and stylized for a particular individual, which includes the representation of all Lwa. Ritually fed and presented, this is a badge of initiation into Vodou. 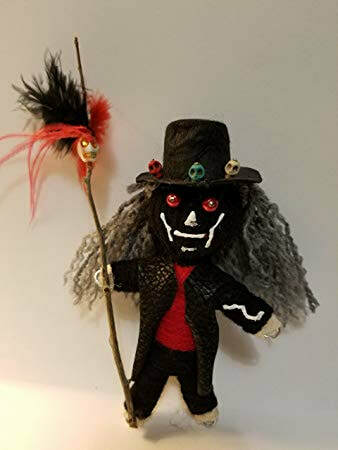 We do not have a single strand beaded necklace for Legba, in whatever color(s) folks are debating belong to him, charged at the crossroads. No cutesy, pink & gold beads for Freda, ritually dipped in champagne. Blue & crystal beads cleansed in the ocean for La Sirene & Agwe don’t exist. Red and blue for Danto or Ogou? Black and Purple beads for Gede & Manman Brijit charged in a cemetery?! 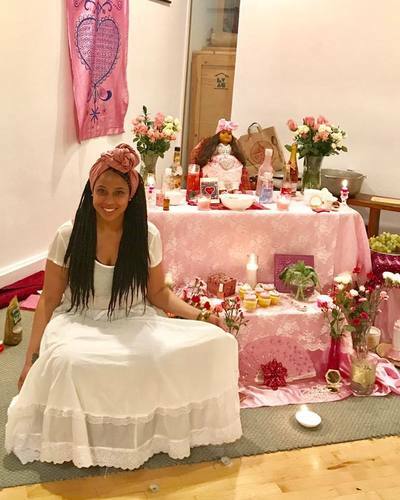 Traditionally, we do not have handmade bracelets, waist beads, anklets, or amulets that are “ritually charged” under a full moon, to “open doors”, aid in protection, love or prosperity in the name of Lwa. 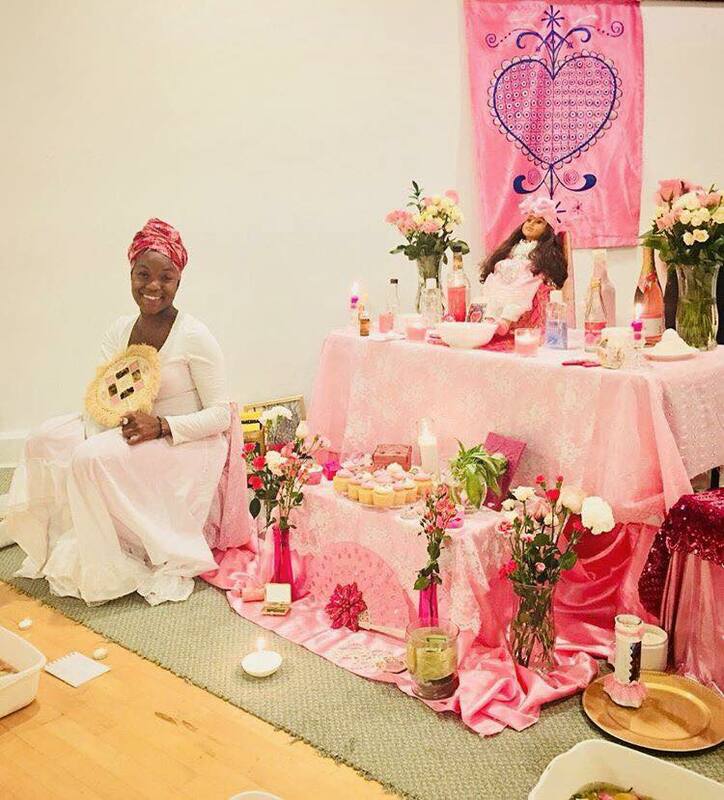 This is Millennial Internet Vodou for monetary gain. This is an individual who is clearly arrogant to think “Vodou Lwa Necklaces” exists, and it’s acceptable to create this nonsense. If someone is making and selling these Etsy/FB/Insta trinkets to you, please know you are simply wearing jewelry - void of any energy from Lwa. If this person is a Manbo or Houngan: THEY KNOW BETTER!! 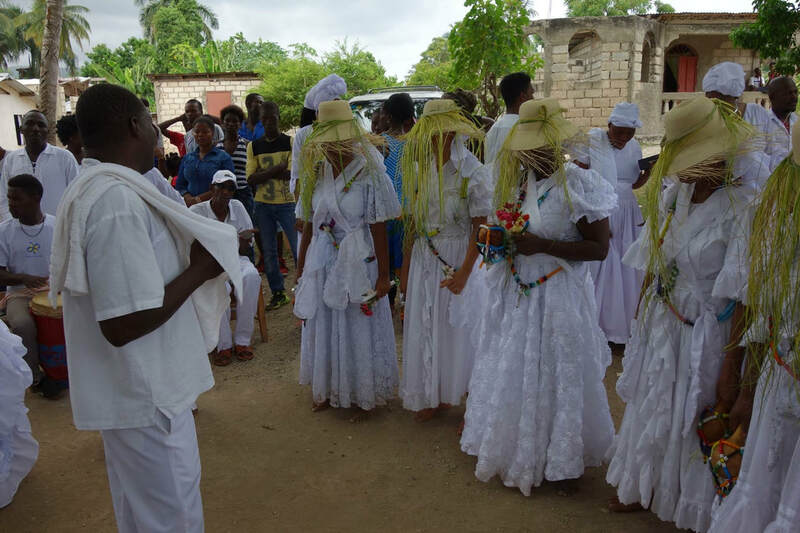 Just as Elekes are received in a beautiful ceremonial fashion, Kolye is ritually washed, prayed and sung upon, by an entire community, with an animal sacrifice included - it is empowered! 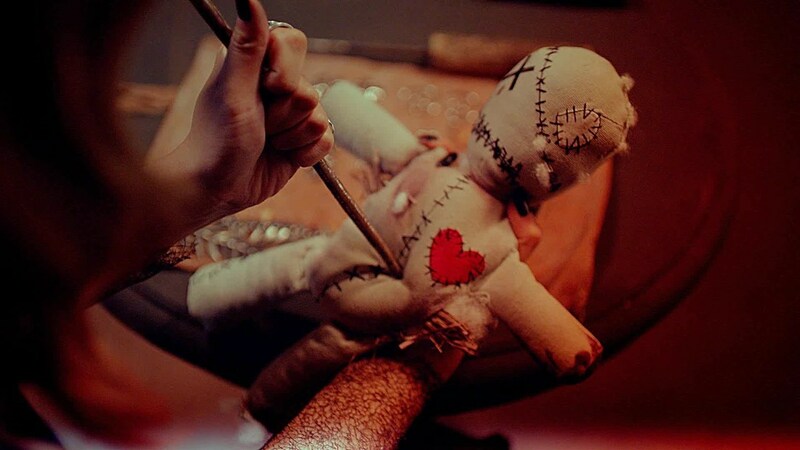 It is ACTIVATED by initiated hands, with license to do ritual work. 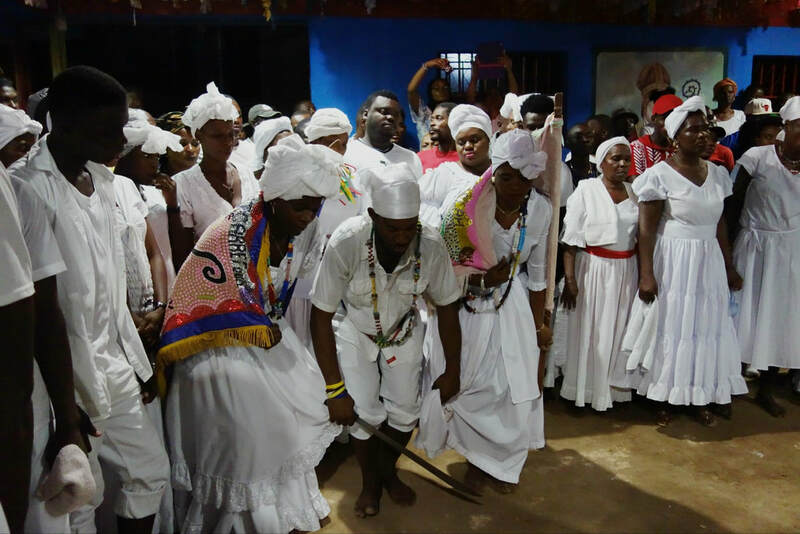 It is then placed upon the neck and crossed across the body of the initiate, which indicates priesthood into Vodou - KANZO, which seals the commitment to be a servant of Lwa until death. Lukumi and Vodou have many similarities, but they are two vastly different spiritual systems. They should be respected and treated as such, when ritual implements/tools & regalia is concerned. Supreme Gratitude to our MOTHERS! We all have a story to tell... and stories were told! Hailing up our mama’s, grandmama’s, aunties, and all of the strong, courageous women who raised us, shaped us, nurtured us...fought for US! We discussed how we honor and empower ourselves within the daily demands and how can one develop strength in oneself and courage. 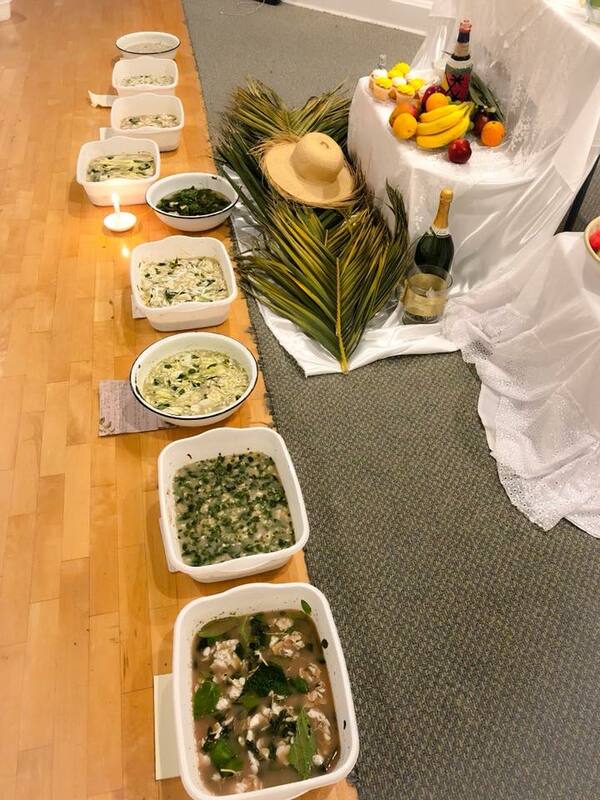 Participants learned a Petwo classic, “Twa Fey”, cleansed with fey, learned about Ezili Danto’s pivotal role at Ceremony Bwa Kayiman, and finally moved and grooved to the hot and fiery Petwo rhythms - all in the name of our Mothers. Give thanks to everyone in attendance, especially my Rara Tou Limen family. It was a beautiful evening. Thank you for trusting this process as I continue to grow, learn and develop. “Portsha’s work is healing and restorative. 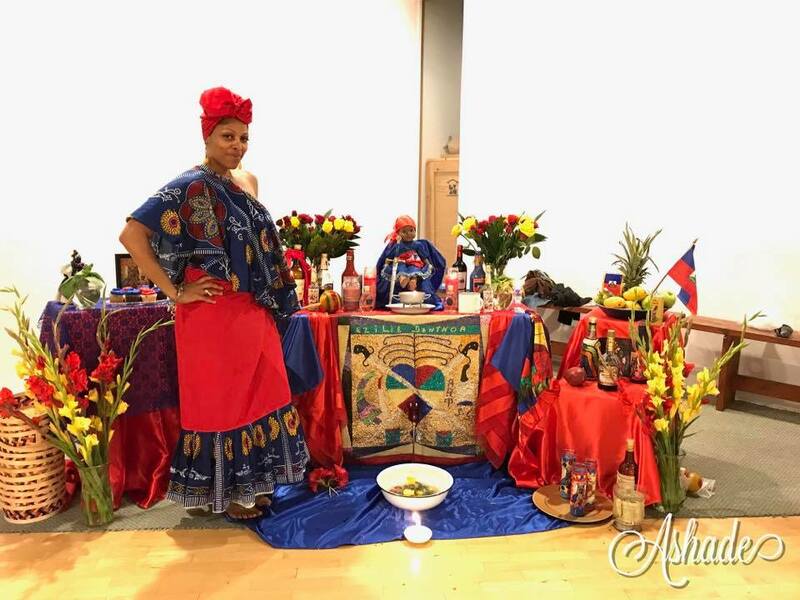 Through ritual, teaching, song, meditation and dance Portsha’s work opens the road to an aligning of our emotional, mental and physical bodies with spirit and breath to heal and revitalize, to welcome Ancestors home. I am empowered to express myself, to appreciate myself and to accept myself unconditionally. Self-love secures me and heals any discord or limited thinking. What has gone before now is dissolved and not a part of today. Now is my time and my turn to successfully demonstrate a greater abundance of love, health, happiness and wealth. 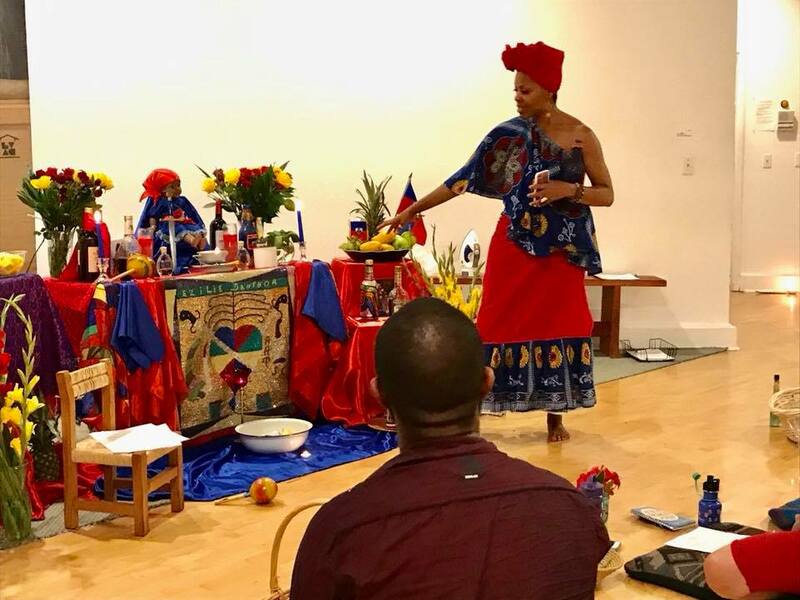 I facilitated the second session of Dancing Spirits: Female Lwa in Haitian Vodou, Saturday evening, in honor of Metres Ezili Freda Dahomey. You know when a workshop is scheduled 7-9pm and participants are so engrossed in sharing, affirming, honoring the love within and simply BEING until 11pm, it's something special! We honored the Divine Feminine within. We revealed our hurt, pain, our sacrifices, our desire to love, be loved and give love. 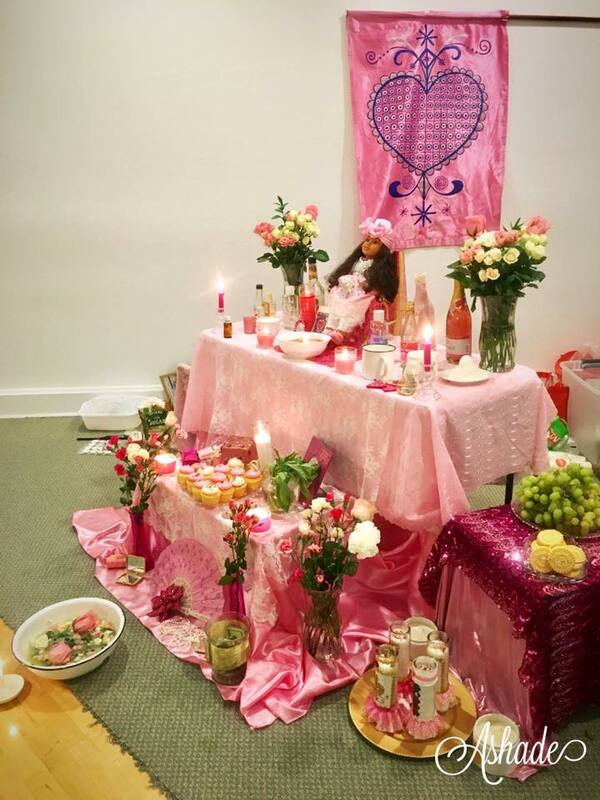 No candles, magic, a petition to Freda for her to bring a man/woman into your life, perfume, offerings, Veves, etc. will simply grant a request. What work are YOU doing as an individual to receive this love? How do you liberate your Mind. Body. Spirit? We must shower ourselves with love, daily, unapologetically, to attract what we are reflecting from within. 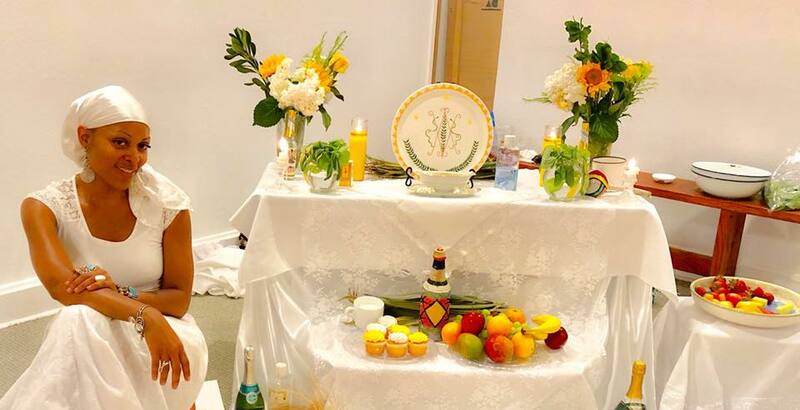 It was a powerful evening that affirmed our devotion to SELF, our needs, wants and desires. Together, we created a bath to bring in sweet, juicy goodness! 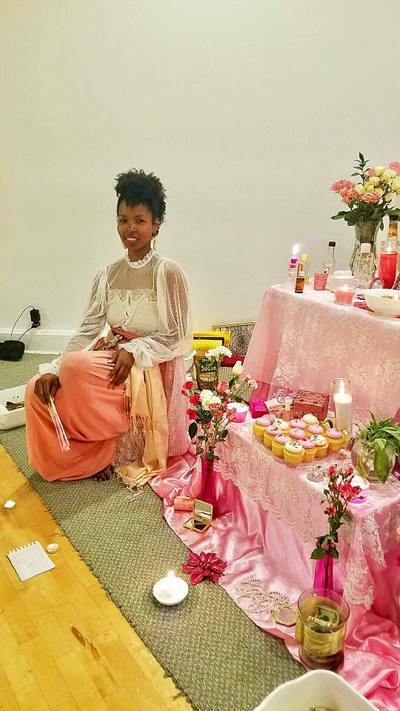 Each bath was personal as each participant brought pink/white flowers of choice, perfume, and a self love affirmation to meditate on while preparing the bath. A special milky concoction that smelled divine, prepared my myself was added to the mixture. When Spirit calls for us to go Anba Dlo - Beneath the Waters, to reflect, tap into our creative self, manifest thoughts, dreams and desires, heal, transform, cleanse + refresh with sweet waters: LISTEN! It became LONG...an entire page! As the list grew, so did my strength and motivation. 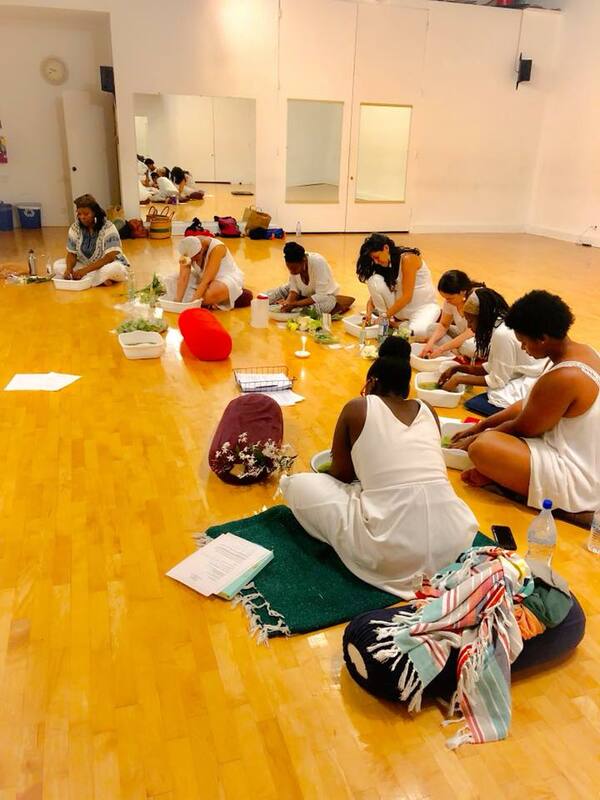 Dancing Spirits: Female Lwa Embodied through Movement, Song, Writing & Ritual Series was birthed. 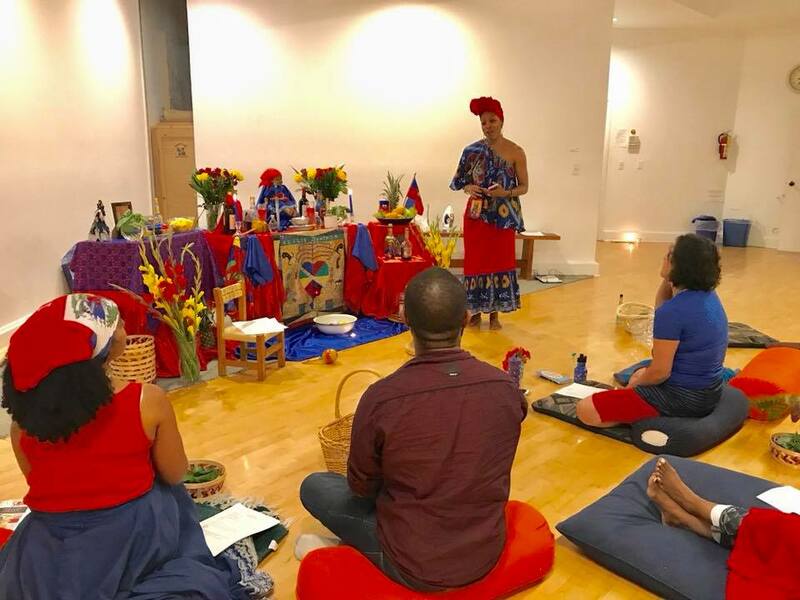 This is an intimate workshop where participants will have the opportunity to retreat inward, channel, heal, learn, write, affirm, inquire about Lwa + Vodou, sing and of course DANCE! I give thanks for the lessons. I give thanks for the beautiful group of women who showed up to the first session honoring La Sirene. They didn't know what to expect. Truthfully, I too didn't know: I went with the flow. We flowed. Together. In the spirit of La Sirene. 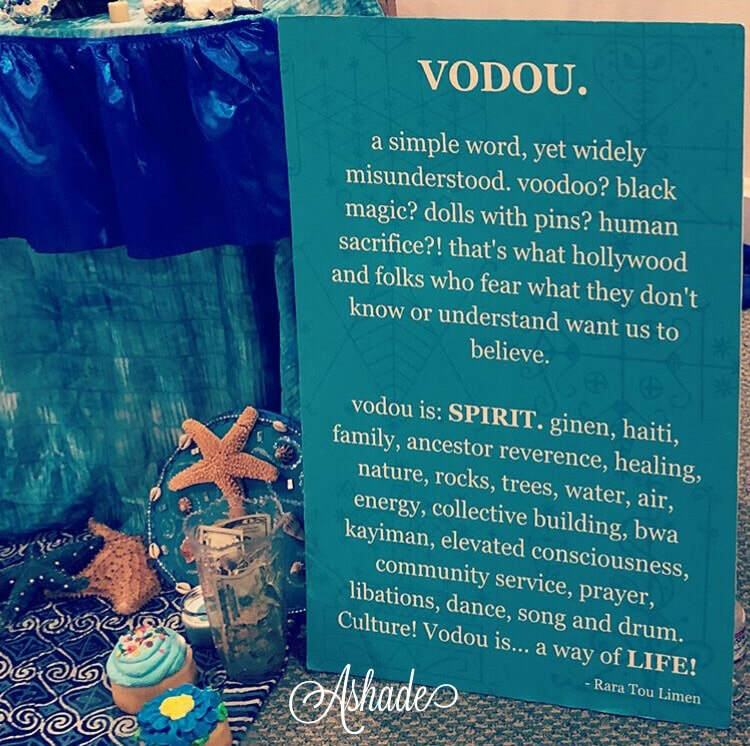 What is true is that Haitian Vodou is rich, healing and serves a purpose. 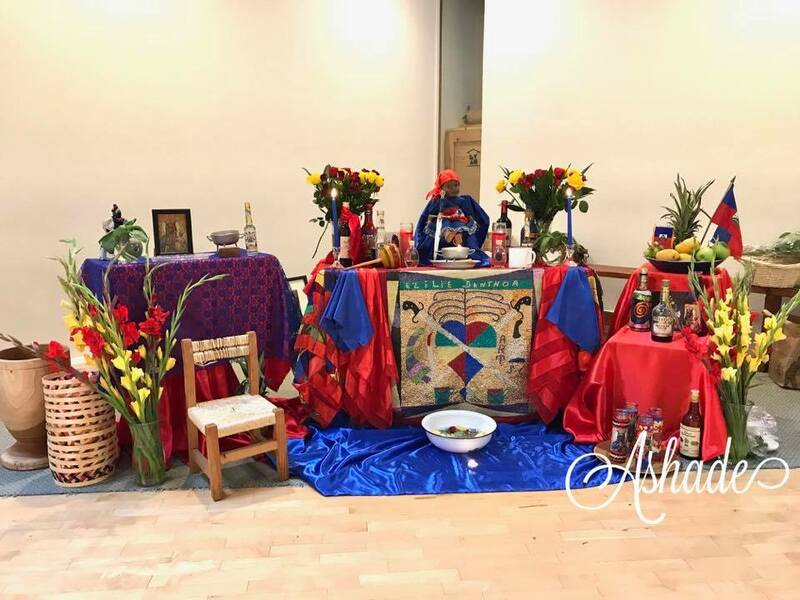 It is a privilege to move from the dance studio to create sacred space for individuals to learn, honor the traditions and most importantly honor SELF. Thank you for trusting this process as my spiritual journey continues. Ayibobo. "Giving thanks to the Creator for sending divine beings in my life who exude so much love, light, strength and courage. It felt so good being in a safe sacred space to just BE and Feel. This spiritual workshop was so necessary on so many levels!! I love what you’re doing. Your authenticity, love and creativity really shows!! 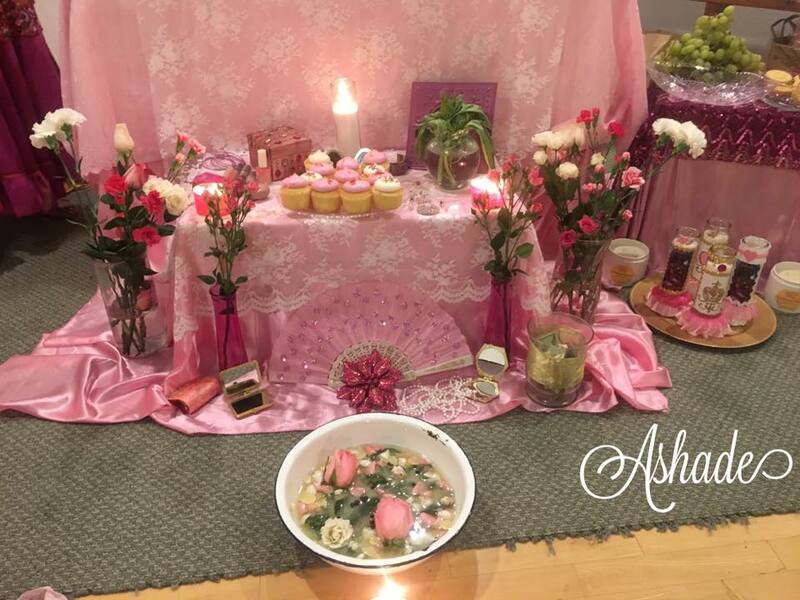 I had a blissful experience learning new moves, song, altar etiquette and cleansing!! Ayibobo!" 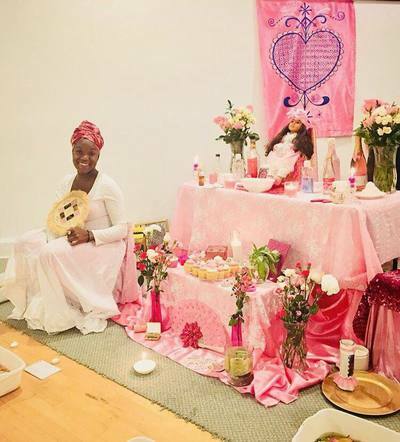 "Thank you Portsha for being committed to the work and your path and for sharing your journey; holding space for us as women to tap in, to reflect, to explore, to heal, to manifest, to transform, to empower, to honor our ancestors and SPIRIT. 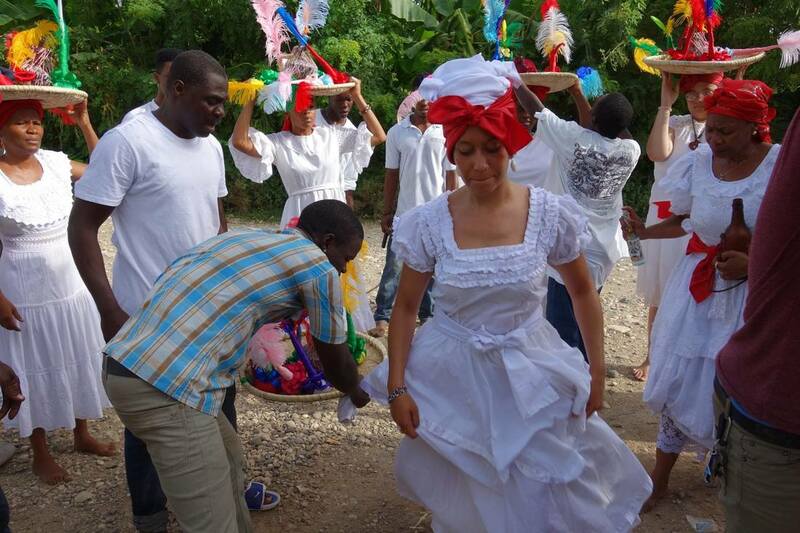 To uplift Haiti through song and dance. There are many things I could say but my heart and spirit is still full." "Thank you for listening and loving spirit as you continue to share and inspire others through your destiny/passion. Your workshop tonight was transformative. Bless you!" 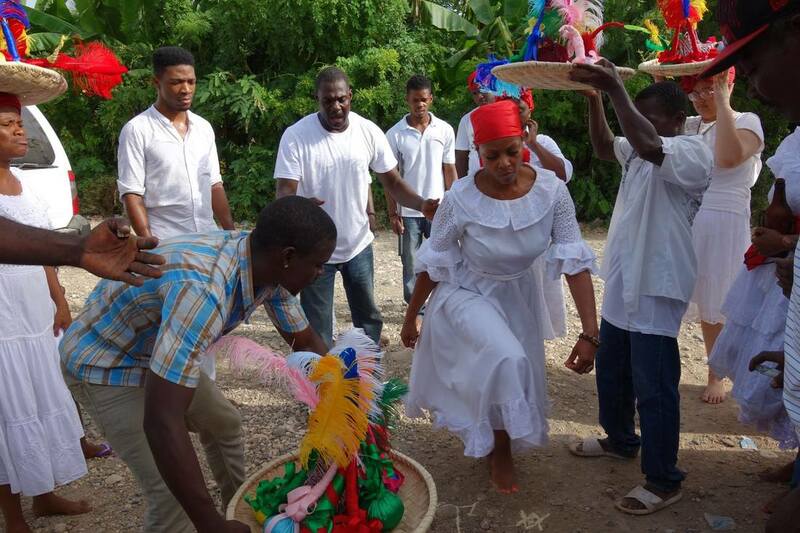 Last month I attended Rara Tou Limen's first workshop dedicated to honoring the Female Lwa in Haitian Vodoun. We danced, sang, and gathered with the energy of La Sirene, explored her watery realms, and the abundance of riches that comes from diving deep and doing the hard work that is only yours to do. The workshop setting allowed the time for lecture and discussion, as well as sharing of experiences, and discovering what brought each of us to the space that evening. It was revealed that we all had in common a deep respect for the culture, our ancestors both blood and given, and the spirits, and a sincere desire to learn more and become more connected to our roots. We moved with wisdom and humility, and the knowledge that through the dance and the drum come healing. The space offered the opportunity to ask questions and receive the answers. I thank Portsha, a powerful and beautiful dancer, a community leader, dance company director, choreographer, creator, artist, educator, sister, and friend, a priestess, and a devoted student of the Vodoun tradition that has called to her so strongly, for opening this space and for her generous offering to share her experience in ways that uplift and empower us all to do our work and our own healing. This is serious work! ...and again and again, she finds ways to multiply the blessings, and does it with grace, ease, authenticity, and the seriousness that we need from our leaders. I know that every workshop will be different, because that's how it is working with nature and spirit! My shortest relationship ever was the closest spiritual/love connection I've ever felt with another human being. It was amazing. Wide open, wanting and READY to build and create with a life partner, my heart was vibrating higher than ever, and it felt so right! That special connection when you laugh together (which was often), you gotta clutch your stomach, that type of love where you gotta repeatedly thank the Universe & the Spirits for listening and answering your prayers. I questioned myself and even asked him "Are we moving too fast?" I was taught to love unconditionally - in every interaction, come from a place of love. My mother exudes love. As a child, teen, young adult and even into my adulthood, I've ALWAYS heard " I love you", always felt the tightest hugs, gentle strokes and received the sweetest kisses from her. My dance students know they cannot come into my class without giving me a hug. Spreading love & showing love is how I choose to move through life and in my relationships. The short lived spiritual love connection ended abruptly. My love was disposed of in a three minute phone call. I questioned myself and my love for this person. "Why did I fall so hard?" I told myself I shouldn't have allowed myself to love this person after three months, because it wouldn't be so hard to let go and move on. I love the way I know how to love: FULLY. This message + meditation is so timely and necessary for my healing. Honoring, Feeling and Releasing, through thoughts, words, writing and actions. Despite the heartbreak and hard lesson, I still continue to choose love. I won't wallow in regret.